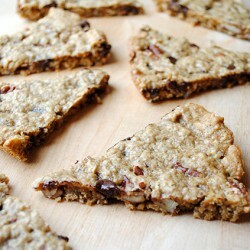 Get ready to click the print or save to recipe button on this one! It’s been a few months since I’ve made a shrimp dish, which is really a shame because they cook so quickly, are packed with protein, and are low in calorie. Let’s not forget they’re completely delicious and can take on almost any flavor combo. 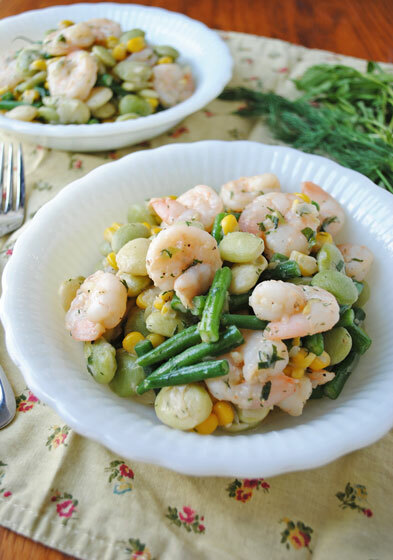 This Summer Shrimp Succotash is going to absolutely knock your socks off! There was really nothing that special about it when I chose this recipe, I just wanted shrimp and veggies. Holy cow did I stumble upon a lip-smackin’ keeper! I guess I gave it away that it turned out above and beyond anything I could imagine. 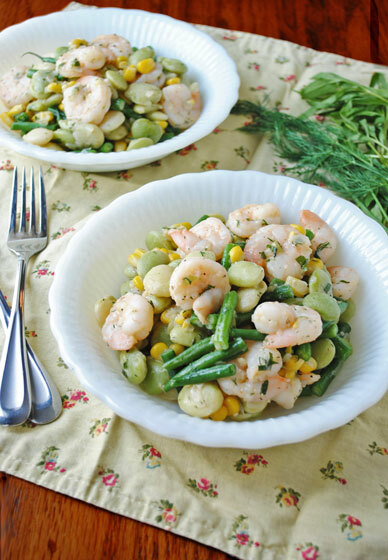 It’s such a simple dish with tons of veggies and that yummy, perfect shrimp. The recipe starts out with you sautéing shrimp tails. Say what? Yep, I pulled them off and threw them in a pan with olive oil. I actually almost skipped this step because I thought it was weird and was feeling too lazy to strain it after. Curiosity got the best of me, thankfully. DO NOT skip this step! It makes the most wonderful 1/2 cup of flavor-packed, savory liquid that will ever come out of your kitchen. I didn’t want to drive across town to get fava beans (and also that lazy thing about not wanting to shell and peel them), so I substituted frozen Fordhook lima beans. This type of lima bean is huge, so it mimics the size of favas. You know I’m a big texture-contrast fan, and this dish makes me happy. 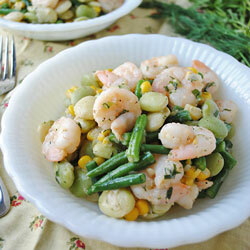 Crunchy green beans and corn, creamy limas, juicy shrimp, all mixed with a rich, buttery sauce. Yep, low calorie and I’m talking butter. You’re going to be licking your lips after this one. I feel like it’s a dish I’d order in a fancy restaurant and be completely lost in every bite. The fresh herbs really bring it all together, except the dill gets outshined a bit with the tarragon. I’m going to try it again with half the amount of tarragon, or perhaps just more dill! I hope you add this to your shrimp recipe file. It’s a definite must-try! 1. Peel and devein shrimp, reserving shells. Set shrimp aside. 2. Heat a medium saucepan over medium-high heat. Add 1 tablespoon oil to pan. Add shrimp shells; sauté 5 minutes. Add stock. Bring to a boil; cook until liquid is reduced to 1/2 cup. Strain liquid through a sieve into a bowl; discard shells. Reserve liquid. 4. Heat a large skillet over medium-high heat. Add remaining oil and 1 tablespoon butter. Add garlic and shallots; sauté 2 minutes. Add corn; sauté 2 minutes. Add shrimp, reserved shrimp liquid, and salt; cook 3 minutes. Add fava beans, green beans, remaining 1 tablespoon butter, dill, tarragon, and hot sauce; cook 3 minutes or until shrimp are done. Remove from heat. Stir in sour cream and pepper. I can’t live without sour cream! Happy you can modify this so the hubs will enjoy it too. I was pretty sad when the leftovers were gone. Thanks, Olivia! 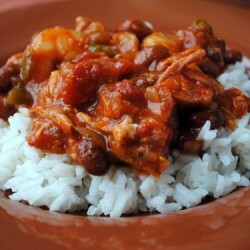 So right about the shrimp…it’s darn near perfect. That dish looks so good! I love shrimp any way you serve it. And the pic is pretty awesome!! Thanks! I can’t wait to setup another “scene” with my new lens. 😉 I think you would go bonkers over the sauce in this. Hope you try it! What a great idea to sautee the shrimp tails! I’ve seen other recipes that will keep the shrimp shell and throw it in the stock. It must give it tons of flavor. This is the perfect summer dinner. Can’t wait to whip it up Leah! Yes! I thought it was so weird, but you’d never believe all the flavor in them for a sauce. Crazy! What an interesting dish. I bet it was awesome!! 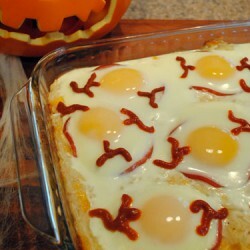 I love this dish! I could eat shrimp just about all the time. 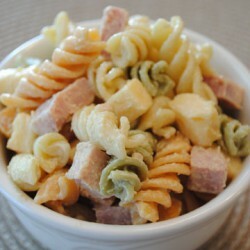 Sounds like this goes perfectly with the veggies! I don’t cook with shrimp much either, but every time I eat it, I remember how much I love it! I love this summer succotash dish! So seasonal and I bet it tastes amazing!